Manufacturer: ? 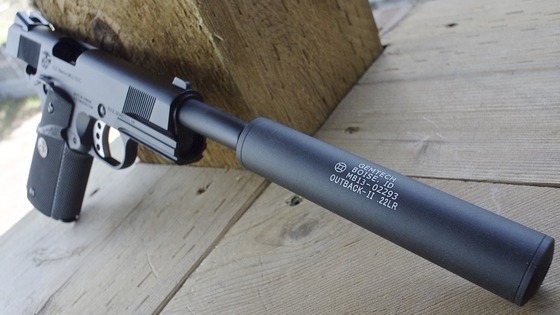 - Distributed by Cybergun. 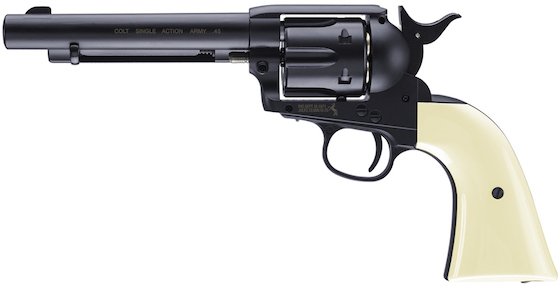 Ammunition Capacity: 19 round full size metal magazine. FPS: 361 using .20 gram BB's. 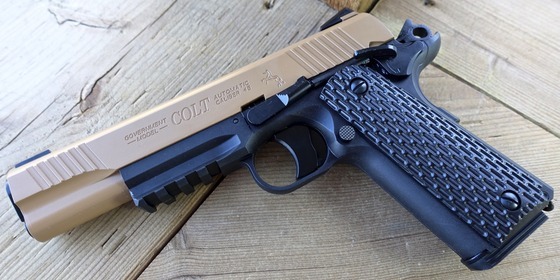 Trigger Pull: The trigger pull on the Cybergun Colt 1911 MKIV CO2 Blowback Airsoft Pistol is exactly what you would expect from a true single action 1911 styled pistol. It has a short take up and then a nice light and crisp release. 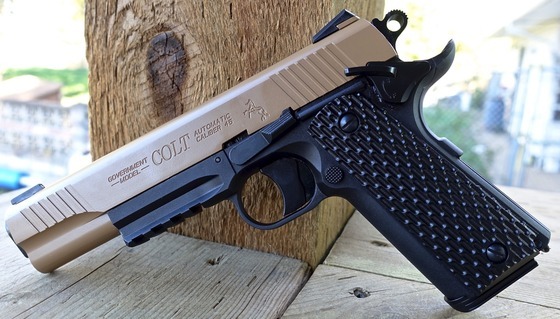 The working grip safety is a nice touch requiring your palm to be pressed against it for the trigger and hammer to operate. 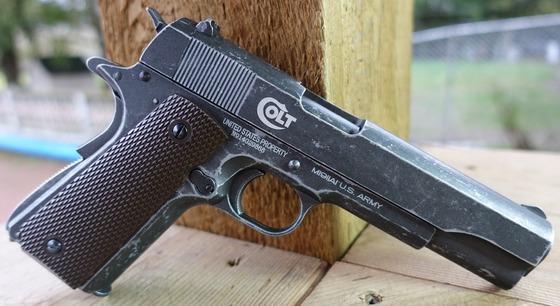 I also like the Tactical Style Trigger found on the Cybergun Colt 1911 MKIV. 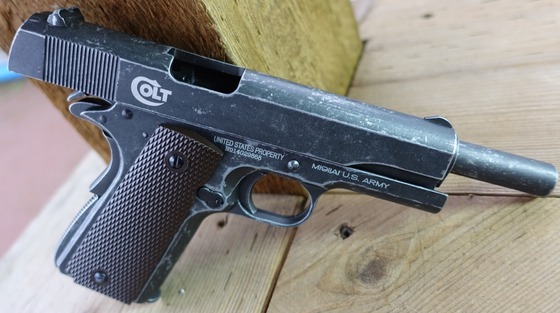 Accuracy: At this point I have not shot the Cybergun Colt 1911 MKIV CO2 Blowback Airsoft Pistol, I imagine it should perform well considering it has spin-up up and a fully adjustable rear sight just in case my shooting is off center a bit. According to the manufacturers claimed fps, we should get somewhere in the mid to high 300 fps range using .20 gram Plastic Airsoft BB's. 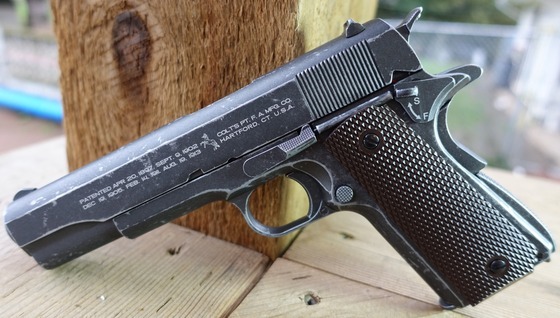 Build Quality: I am kind of sitting on the fence with the Colt 1911 MKIV Pistol, on one hand it is an all metal gun with what looks to be fairly decent fit and finish but on the other hand it feels kind of light weight especially with the heavy magazine out of it compared to even the KWC 1911's I have reviewed so often. 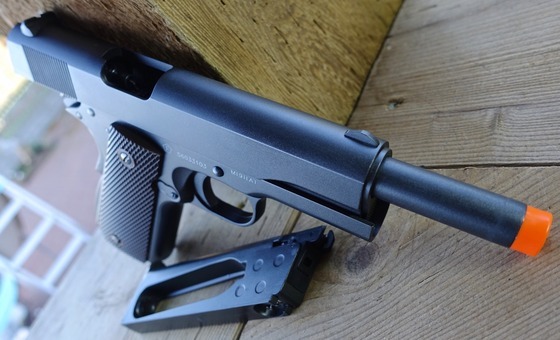 It may be that more aluminum is being used in this pistol which could actually be a good thing since aluminum would be a higher quality metal over your typical zinc alloy used in most Airsoft and Airguns these days. In terms of operation, I feel like some of the mechanical parts need a bit of break in time, but I have found this to be true with many real guns I have used. 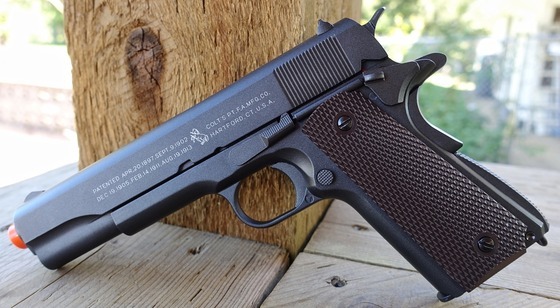 Realism: The Cybergun Colt 1911 MKIV CO2 Blowback Airsoft Pistol is a close replica of the real steel Colt 1911 45 auto but with a more modern Tactical look to it, sporting a Tac style trigger and hammer, double stack magazine, ambidextrous safety and adjustable rear sight. 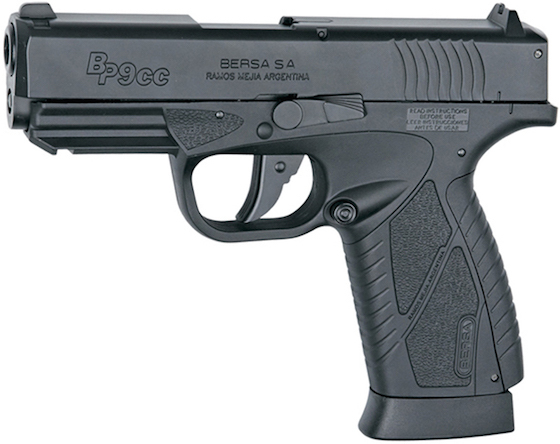 This gun is nearly all metal with very full blowback operation making it feel real to hold in the hand and shoot. 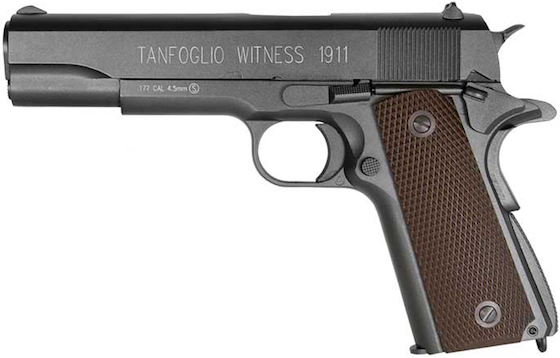 Accurate Government 1911 styled replica. 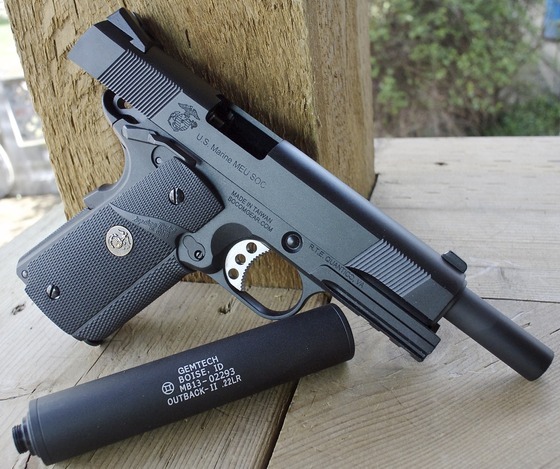 Double stack metal magazine holds the CO2 and extra BB’s. 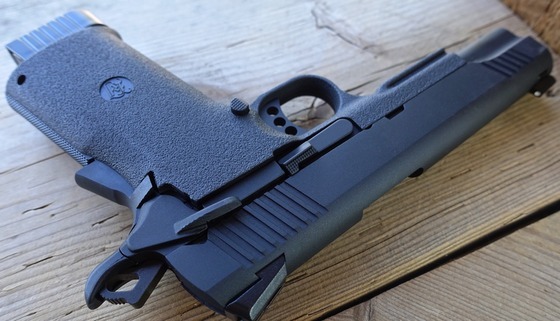 Tactical trigger and hammer with ambidextrous trigger for a more modern look and feel. 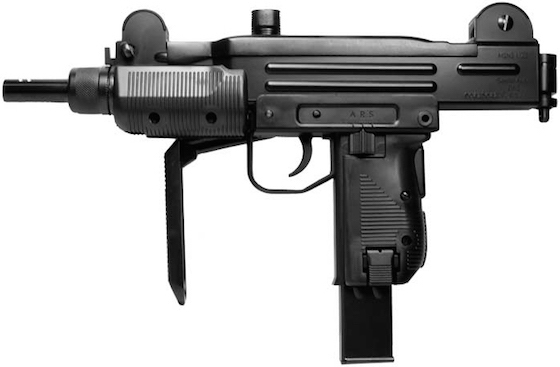 Comes with the ugly red tip that is really stuck on the gun. Can kind of tell the Chinese quality a bit. 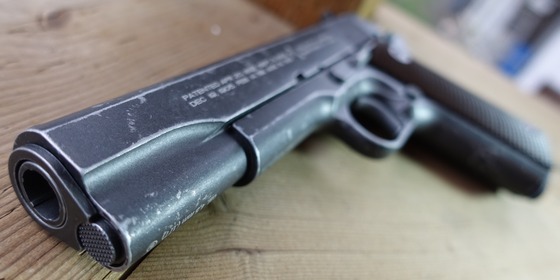 Licensing is not engraved right into the gun. 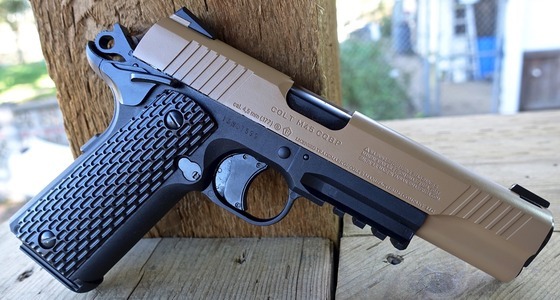 Overall the Cybergun Colt 1911 MKIV CO2 Blowback Airsoft Pistol is another nice option if you're looking for a Colt Government 1911 Styled Airsoft pistol. Keep in mind this one is Chinese made rather than made in Taiwan. Not sure how that will effect performance and longevity. I have owned Chinese guns that have shot and faired well for me so I am not too worried about it. 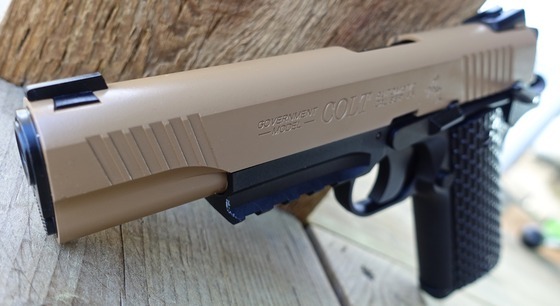 With its double stack magazine you will find the Cybergun Colt 1911 MKIV to have a fairly large handle so it may not be suitable for those with smaller hands. 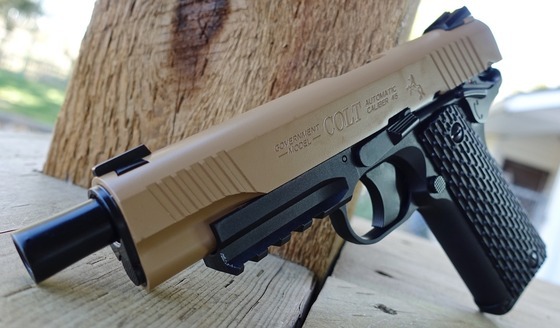 I do think the Cybergun Colt 1911 MKIV CO2 Blowback Airsoft Pistol features a nice combination of classic Government 1911 looks with a few modern tactical components lie the upgraded trigger, hammer, ambidextrous safety and rear adjustable sight. 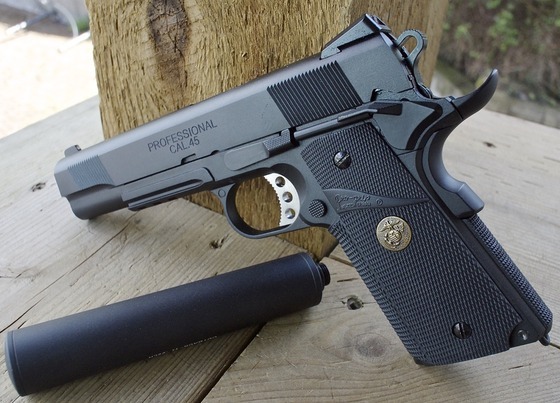 Model: Model 1911 All Metal. Ammunition Type: Airsoft plastic 6mm. 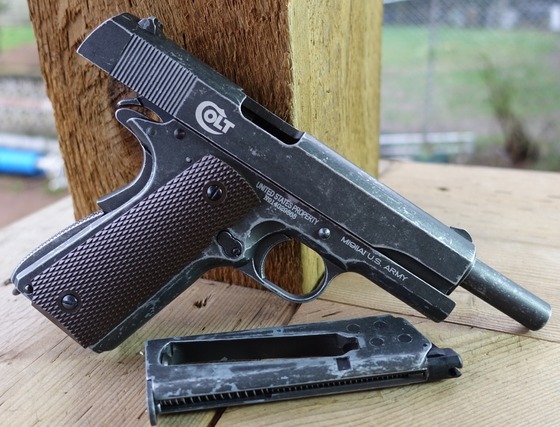 Trigger Pull: The trigger pull on the KWC Model 1911 All Metal Non-Blowback CO2 Airsoft Pistol was about medium to hard but I have definitely experienced heavier trigger pulls on many double action only Airguns. 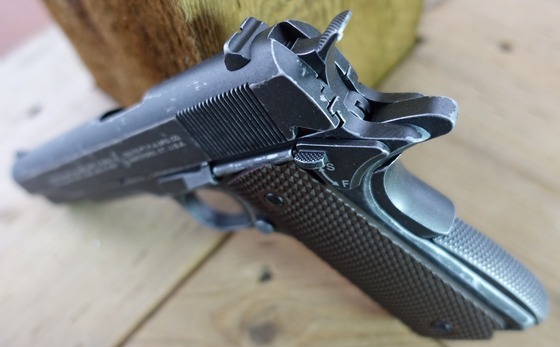 It is nice that the trigger has the look of a 1911 and not your typical lever styled trigger. 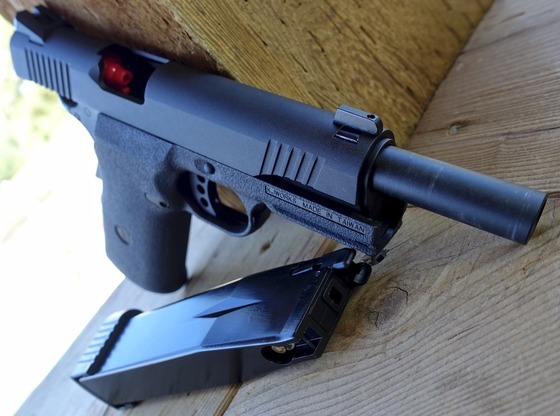 I did find the trigger to be very usable and the release point is smooth and fairly predictable. 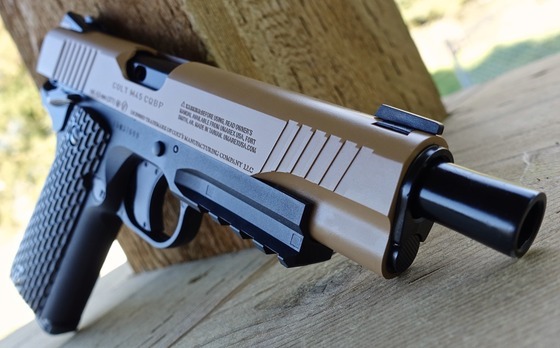 Accuracy: I have yet to perform my field test shooting component for the KWC Model 1911 All Metal Non-Blowback CO2 Airsoft Pistol, however I have reviewed the same gun in 4.5mm Steel BB Cybergun version and here is what I had to say about that the Steel BB version: "Accuracy was decent but not outstanding, I got around a 2.5 inch grouping from a 20 foot away free standing position, shooting just to the left and high on the target. 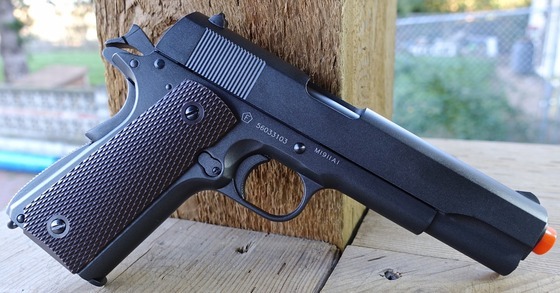 I did find that I was able to zone in a bit better with the Cybergun GSR 1911 as I got used to the trigger. 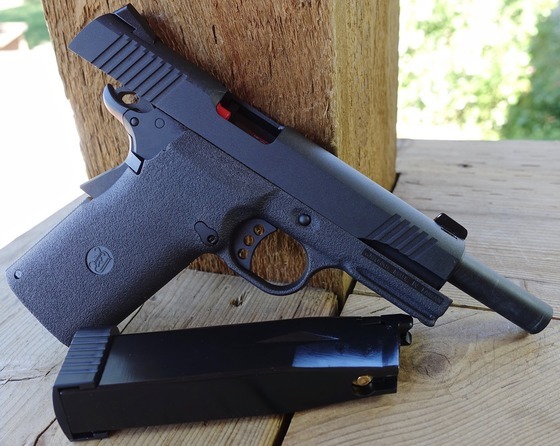 I also put the Cybergun Sig Sauer GSR through my Chrony Chronograph and got very close the manufacturers 397 claimed feet per second, actually starting off well above it and settling down to around the 370 FPS mark. My 8 shot average on a new CO2 was actually 422 FPS." 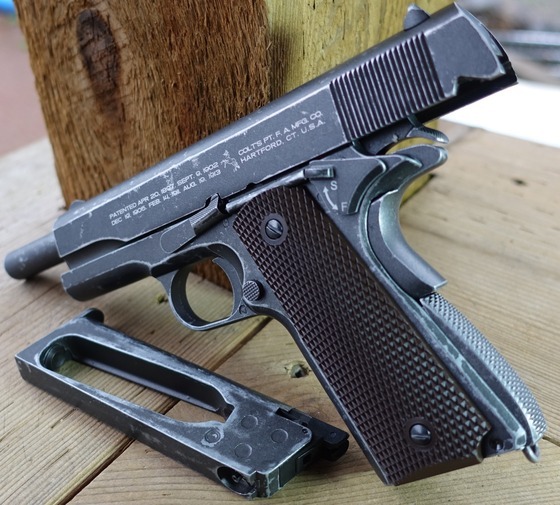 Build Quality: The build quality for the KWC Model 1911 is very good, this is an almost all metal Airsoft gun with a few exceptions like the hammer, trigger. 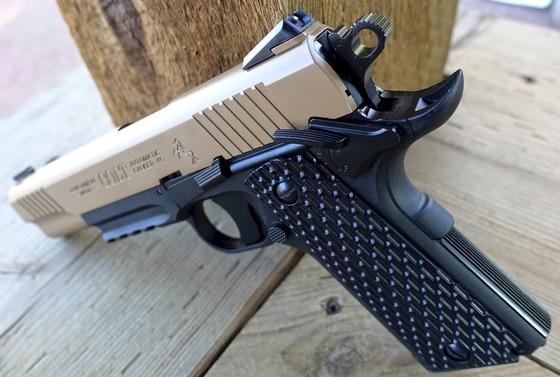 magazine release, slide catch and grip safety. 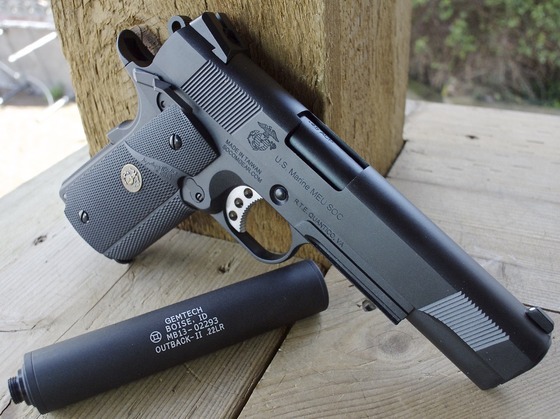 Pretty much everything else is metal including the slide, frame, magazine, and even the grips. 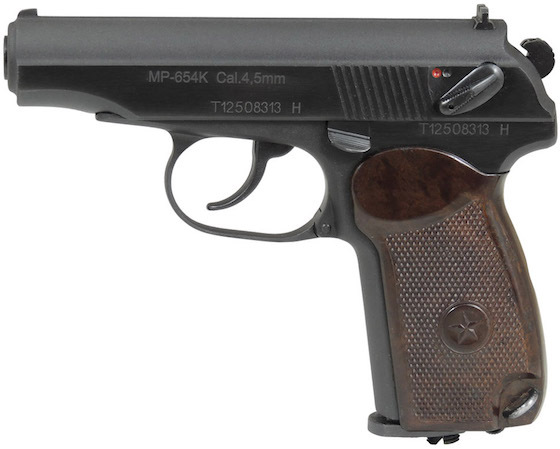 The finish is very good and since there is lots of metal with minimal moving parts and less to go wrong, this should make for a very reliable pistol. 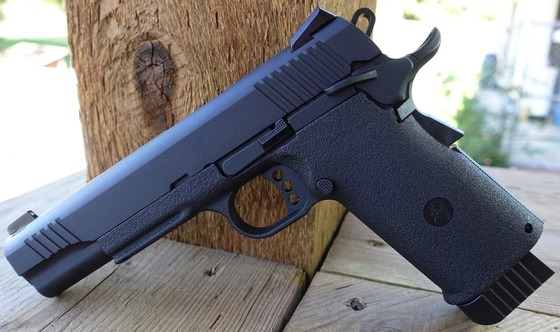 Realism: The KWC Model 1911 CO2 Airsoft Pistol is very close to the look, weight, and feel of the real steal Sig-Arms 1911 GSR! 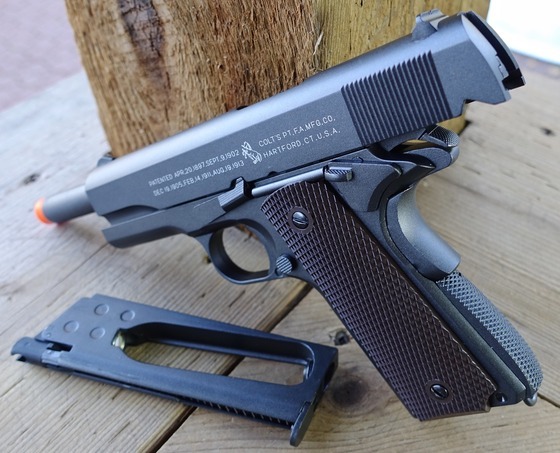 Even the 1911 style trigger was replicated as best as it could be given it being double action only. 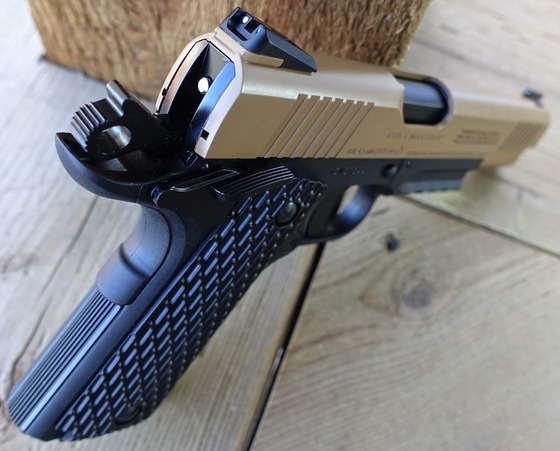 It would have been nice to have a single action trigger and a working slide to finish off the illusion but overall the GSR is a really nice copy of the real steel Sig Sauer GSR Sig-Arms 1911 firearm. 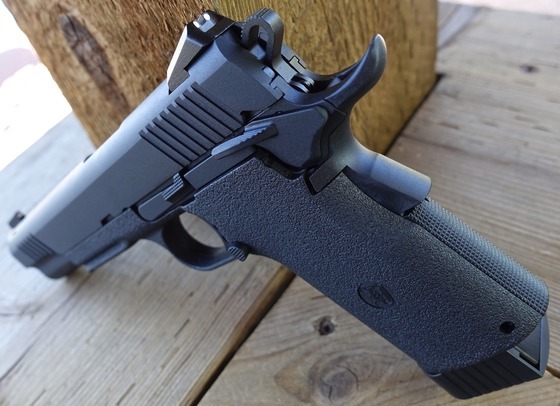 Very Accurate Sig-Arms Sig Sauer 1911 GSR Replica. Trigger action is bit heavy but not not too bad for a double action trigger.